Electricity… telephone… cable TV… Internet... the communication lines that support access to these modern essentials are in constant use. Line installers and repairers maintain the power systems and cables needed to keep access flowing. The power grid is the network of power lines that moves electricity from generating plants to customers. Electrical power-line installers and repairers install and maintain the power grid. Telecommunications line installers and repairers work on the lines and cables used by network communications companies. Line installers dig underground trenches and erect poles and towers to install new cable. They use construction equipment, such as trucks equipped with augers and cranes, to dig holes and set poles in place. Line repairers replace old equipment and maintain existing lines. The work can be physically demanding. Work is often performed at great heights or in confined spaces, and outdoors under challenging weather conditions. Workers need good balance, and the strength to climb utility poles and transmission towers. 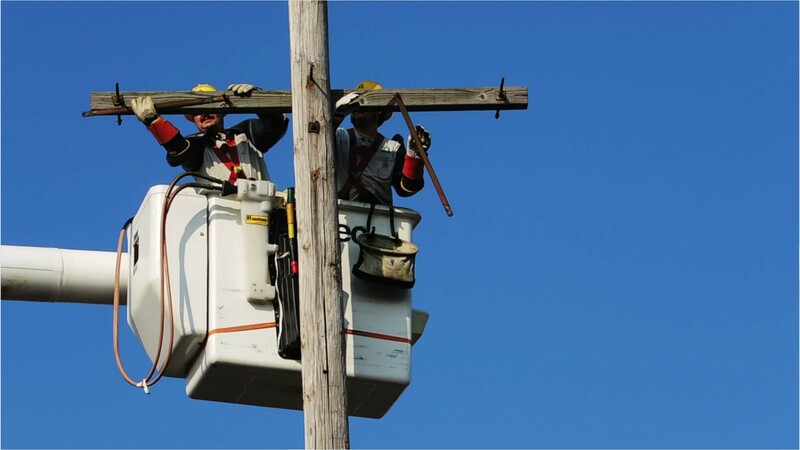 Line workers maintain strict safety procedures, as they encounter hazards such as falls, high-voltages or dangerous gases, which make the occupation among the most dangerous. Although most work regular full-time business hours, some must work evenings and weekends. Some workers travel to maintain a large region. In emergencies workers may have to work long hours for several days in a row. Most entry level positions require a high school diploma or equivalent; line installers and repairers receive long-term on-the-job training to become fully proficient. See more details at O*NET OnLine about electrical power-line installers and repairers. Electrical Power-Line Installers & Repairers by U.S. Department of Labor, Employment and Training Administration is licensed under a Creative Commons Attribution 4.0 International License.